Escape the Crowds with Motorcycle Classics! 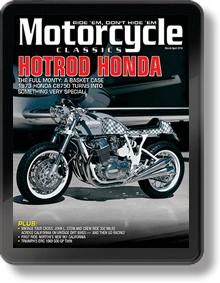 Motorcycle Classics is America's magazine for collectors and enthusiasts, dreamers and restorers, newcomers and lifelong gearheads who love the sound and the beauty of classic bikes. Every issue delivers exciting and evocative articles and photographs of the most brilliant, unusual and popular motorcycles ever made! Simply fill in your information below to receive 1 year (6 issues) of Motorcycle Classics Digital subscription for only $24.95!